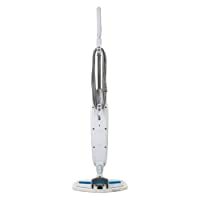 The Bissell 1940 Powerfresh is a steam cleaner about the size of a standard mop. Steam cleaners can be used for both mopping and sanitizing hard flooring such as wood and tile. 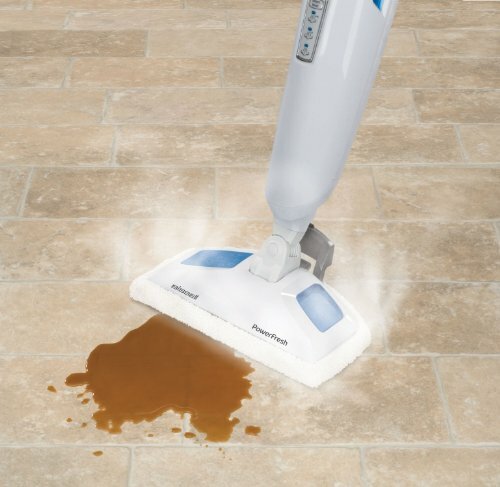 The cleaner works on most standard floor surfaces, but there have been cases where the Powerfresh has damaged laminated floor (Bissell says the cleaner works on laminate but it is best to check with your manufacturer before using the unit). The highlights of the Powerfresh are that the flat plastic head that can swivel to reach into corners and crevices, and it has a detachable water reservoir for easy refilling. The sides of the mop head are large enough there’s no danger of scratching walls when you clean hard to reach areas. The head can rotate a maximum 270 degrees, and it has a sturdy enough base that the head won’t break down before the rest of the unit. The water tank holds 15 oz which will last roughly half an hour to an hour. Sanitizing requires holding the Powerfresh in place for roughly 15 seconds. If the water does run out the tank can be removed and refilled while the steam mop is still in use. The appliance takes about 30 seconds to warm up. Once the appliance indicates it’s ready there are three steam settings to choose from. They operate on levels of pressure respectively. There is no off button, however, so be careful when turning it off and be aware of where you leave it to cool down as it will be hot. There are no cleaning supplies with the Powerfresh so you can’t add soap into the water supply. This is replaced by a scent disc option. The unit comes with two scent discs that are meant to freshen a space after it has been steamed. While the Bissell 1940 will do an adequate, reliable job of cleaning your floors, it does not by any means stand out in comparison to other steam floor cleaners. It&apos;s main boons are that it is maneuverable and convenient to use. However the fact that it cannot work on all floor surfaces and it lacks any stand-out features for its mid-range price point are huge drawbacks. Sophia is a writer writing about fiction and life. A comic enthusiast she is trying to make life as full and expressive as possible. Occasionally that means finding the most out the smallest but those are the important parts of life that need to be exposed and explored.